Developing a new propeller takes over one year of computer calculations to ensure the props are equally efficient at any speed and under any load. Cavitation tunnel test, real-life close-up studies of prototypes and boat testing. All this, to determine that the feel is perfect and what performance they give. We continuously develop the entire package: engine, drive and propellers. 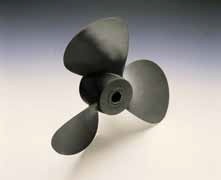 A correct choice of propeller is absolutely vital to get the most out of your engine and boat. Their performance decides whether the power produced by your engine and drive is turned into boat performance - or not. And it's not only size and pitch that matters. Genuine Volvo Penta propellers are designed for their specific task. The wide range covers propellers for shaft installations, single-propeller drives, Duoprop drives and saildrives as well as for the revolutionary IPS. Production quality is exceptional with minimized tolerances, ensuring high and reliable performance, year after year. Volvo Penta propellers are perfectly matched to engine characteristics and drive hydrodynamics. This gives you the best overall efficiency, which benefits you and the environment as you reduce fuel consumption. It also gives your engine and drive a long service life, as they work with the load they've been designed for. The different materials used are all super-strength and crafted for propeller duty. This gives a certain built-in flexibility. The material handles the forces without bending or breaking. A combination of curving, blade surface and cavitation design. Only when all these factors are perfect do you get maximum efficiency. Each propeller is perfectly in balance, in weight, size and cavitation. Essential for secure grip in curves and driving safety. Much more than a piece of rubber! Each propeller has its bushing specifically adapted to handle turning and pulling forces. The bushing gets its final shape and performance when the correct fastening torque is applied. Essential for smooth shifting and long drive-train lifetime. Long hub propellers can be identified by looking at the length of the hub splines. Long hub splines do not extend to the full length of the nut end of the spindle. Prop shaft length from gear housing to end of shaft 5-3/8"